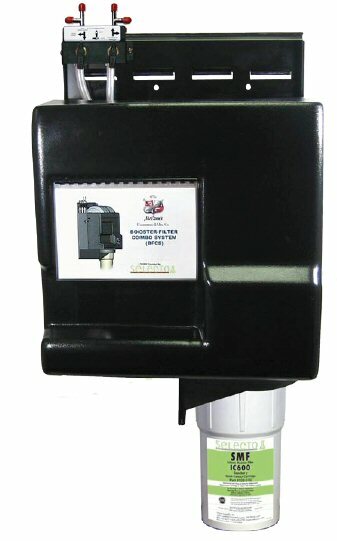 Water Booster Data: McCann's 2 Gallon, 115V, 60 Hz. Flow Rate: Maximum: 100 gph Oz. Available from 80 â€“ 100 psi: 21 Oz. Total Reserve Available at 40 psi: 93 Oz. 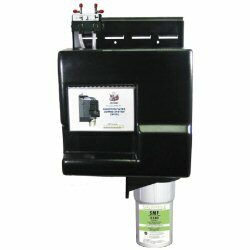 One filter can do it all: dirt reduction, chemical reduction and chloramines reduction! No pre-filter required! The first Jumbo Sanitary Filter on the market! Nylon construction to withstand high pressure! 30 times the chloramine reduction of a conventional carbon block! Modular filter design for up to 50% less installation time! IC600 has been tested and certified by NSF International against ANSI/NSF Std. 42. Please visit www.nsf.org for specifi cations. Do not use with water that is microbiologically unsafe or of unknown quality.